Dimensional Insight is a privately held company based in Burlington, MA, with 2,600 customers worldwide and five international offices. The company helped to pioneer the modern BI industry with Diver, a BI toolset that provides fast, flexible information distribution. Diver’s core strength is its ability to empower users with fast access to critical measures needed to meet operational performance and compliance requirements. Started in 1989 in the formative stages of the business intelligence market, Dimensional Insight set out to build an integrated platform with tools that address the various BI project roles. The company’s product, Diver, includes a 100 percent in-house built set of ETL (extract, transform and load data), administration, dashboard development, data modeling, reporting and data management tools. Users can navigate multidimensional data sets with good performance. Although the product supports industry-specific content including adapters, business rules and master data, its user interface lacks the modern visual design offered by some competitive products. Staying focused on meeting customers’ needs, Dimensional Insight has evolved its product line to include solution accelerators that have propelled its success in highly regulated industries, such as healthcare, manufacturing, and goods and services. Through its longstanding solution-focused strategy and direct sales efforts across the world, Dimensional Insight has accumulated a loyal base of satisfied customers over the past three decades. Driving its success are an integrated BI platform, packaged industry solutions and superior customer service. The company focuses on specific markets, namely hospitals, alcoholic beverages, supply chain and finance, and derives much of its growth from tactical marketing, referrals, and customers who join different organizations. 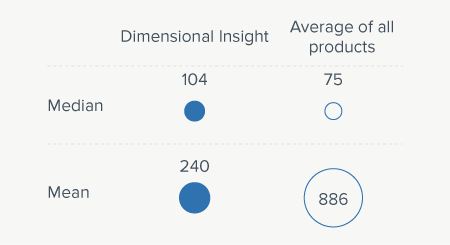 Dimensional Insight customers are primarily medium-sized companies. Compared to the previous BI Survey, its mid-sized customer base has decreased while it now serves more large companies. The product’s median number of users stands at 104, higher than the average, which is a reflection of the vendor’s focus on operational teams within manufacturing and healthcare provider organizations. 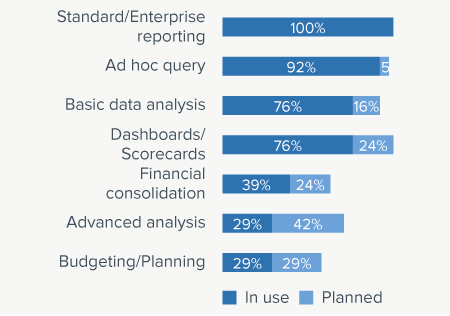 100 percent of participating users use Dimensional insight for standard/enterprise reporting, followed by ad hoc queries with 92 percent as well as basic data analysis and dashboards/scorecards with 76 percent each. A minority uses the tool in financial consolidation, advanced analysis and budgeting/planning processes for data visualization. In last year’s BI Survey, ‘View’ was the most frequent task carried out by customers with Diver Platform. 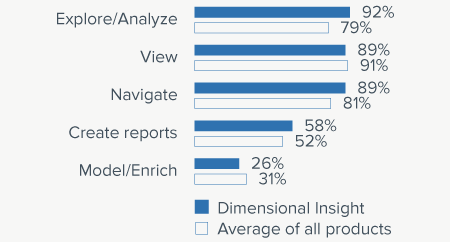 This year, ‘Explore/Analyze’ is the most commonly performed task with ‘View’ and ‘Navigate’ not far behind. Over 50 percent of business users use Diver Platform to create reports. BARC’s Vendor Performance Summary contains an overview of The BI Survey results based on feedback from Diver Platform users, accompanied by expert analyst commentary.